Posted March 5th, 2017 by Mike Boyes & filed under Human Development, Intervention: Children and Adolescents, Research Methods, Sensation-Perception. Description: Is horseback riding good for children (in ways beyond getting them out of the house, away from screens and more active)? Decide what you think and then read the article linked below and see what the researchers report. Oh and if you think there might be a positive effect then explain why that might be. 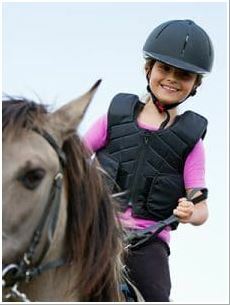 Source: Horse-riding my enhance children’s ability to learn, Rick Nauert, PsycCentral. So yes, there seems to be an effect, but what do you make of the explanation? I had a little trouble understanding how the motion of the horse influenced the child riders’ sympathetic nervous systems. That aside, I can see how being “jazzed up,” which is a way of talking about what heightened sympathetic nervous system activation feels like, would help with behavioural tasks, though I am not sure that I would support a hypothesis that it would also effect math task performance (IF the task in complex, according to the researchers). Mainly I was a bit disappointed as there have been numerous reports (but little in the way of well-grounded research) on positive effects of spending time with horses, riding and/or “whispering”. The researchers are correct in saying that “there are many possible effects of human-animal interactions on child development” but they are also correct in saying “…few studies have addressed the effects of horseback riding on children and the mechanisms underlying how riding affects humans”. I suppose I was hoping for more from the current study being reported upon in line with the previous last statement. Maybe hold off on buying a horse as a way of improving your grades, for now. What effects did horse-riding have on what sorts of children’s learning? What was it about the participant’s experience that was specifically provided by the horses? How else might that have been provided? If there IS something to these finding how might they be applied to child learners in general (especially given the prohibitive costs associated with riding)?